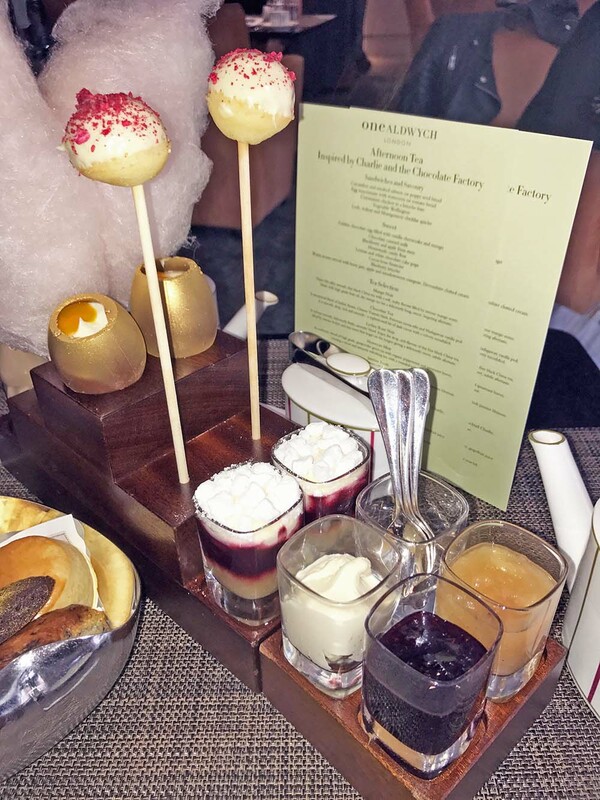 Visiting London's Fabulous Willy Wonka Afternoon Tea at One Aldwych – The Discoveries Of. Nowhere does afternoon tea quite like London. But sometimes it can get a bit (dare we say it) dull. The Charlie and the Chocolate Factory afternoon tea at One Aldwych is a culinary adventure in the heart of the city. 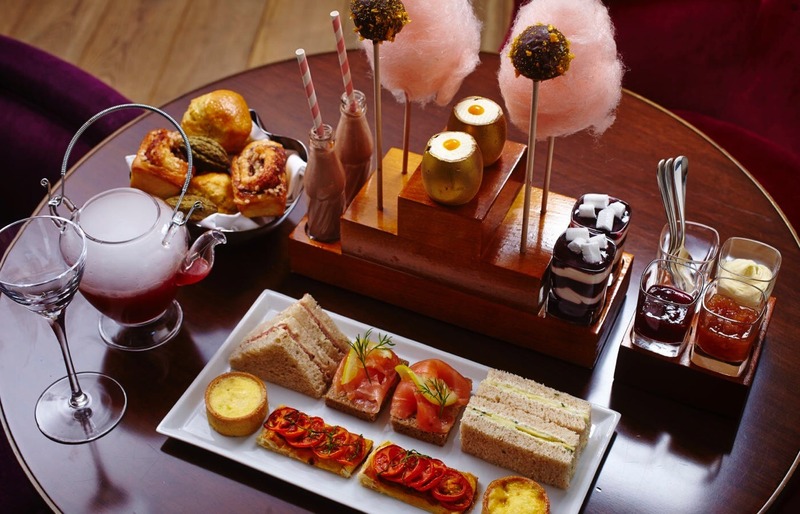 A Charlie and the Chocolate Factory Afternoon Tea… is something that the 8 year old me would have fantasised about. And 12 year old me. And to be quite frank, me right now. One of my favourite childhood books, combined with a truly British afternoon tea, my favourite meal of the day? Was I dreaming? No, I was not. Which is how I found myself popping into the charming One Aldwych in London ready for an afternoon of delicious decadence. I love any meal that starts with champagne. After making our way to the chic Mezzanine level of the Indigo Restaurant of the One Aldwych Hotel in Covent Garden, we were warmly greeted and seated by the maître d’. Our waitress, Fanta came over to the table with a big smile and poured us an equally generous glass of champagne. Next up was a brief runthrough of the menu, after which Fanta left us to soak up the atmosphere. The buzzy restaurant was decorated with a high end and stylish decor – striking the perfect balance between modern and timeless. Before we knew it, Fanta had delivered our first course of savouries and finger sandwiches. The savouries were perfection. We were served a smoked salmon and chive crème fraîche sandwich, egg mayonnaise and watercress sandwich, coronation chicken bun, a leak, walnut and cheddar quiche and a mini vegetable wellington to round it off. Beautifully presented on a matching black and white striped plate, they were fantastic. If I had to pick, the vegetable wellington was my favourite – it was sublime. I mean, I may have even asked for a few more. We’ve chosen our very favourite afternoon teas in London. How many have you been to? Read now. “He turned and reached behind him for the chocolate bar, then he turned back again and handed it to Charlie. Charlie grabbed it and quickly tore off the wrapper and took an enormous bite. Then he took another…and another…and oh, the joy of being able to cram large pieces of something sweet and solid into one’s mouth! The sheer blissful joy of being able to fill one’s mouth with rich solid food! Roald Dahl was clearly a man who understood the pleasure of food – something that goes to the heart of the Charlie and the Chocolate Factory afternoon tea. No detail was too small, everything was… dazzling and delicious, just the way that Willy Wonka would have wanted it. After another well-deserved glass of champagne, we moved on to the sweet portion of our meal. Our Charlie and the Chocolate Factory themed delights were brought out on a grand cake stand. What was on the stand? In short… a golden chocolate egg filled with a vanilla cheesecake and mango compote, chocolate caramel milk presented in a tiny glass bottle, blackberry and apple eton mess, homemade rhubarb and custard candy floss, lemon and white chocolate cake pops, a cocoa bean financier, blueberry brioche, and to top it all off, warm plain and raisin scones served with berry jam, apple compote and Devonshire clotted cream. Goodness me, that was a mouthful. Literally. By this point, the 10 year old me was having an absolute field-day and I can imagine Augustus Gloop would have been having the same. Every time I thought that I’d had the best thing on the plate, I would eat something else and change my mind. I can honestly say that this was the best plate of sweets that I’ve ever had at an afternoon tea. So delicious, yet so fun and quirky at the same time. We finished with another glass of champagne (because… why not?). By the time we rumbled out of the hotel, the verdict was in. The Charlie and the Chocolate Factory Afternoon tea at One Aldwych was fantastic. A real treat with a modern twist on a classic. I will most definitely be returning. What Next? Check out our guide to London’s best afternoon teas or read our full range of London travel tips, guides and features.